What Is a Lockdown in Yu-Gi-Oh? 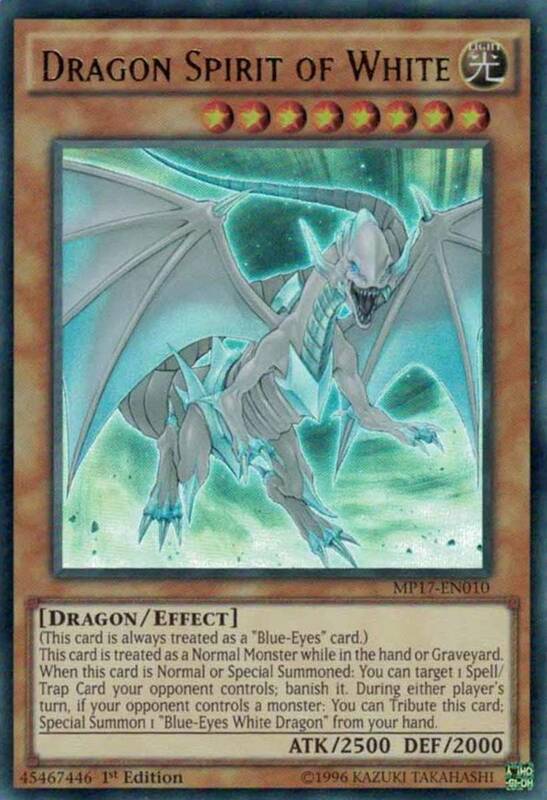 In Yu-Gi-Oh, competitive duelists use a variety of "lockdown" tactics to disable opponents from employing certain types of cards, limiting their ability to counter your plays. This can range from preventing attacks to negating magic cards, but often locking units also hinder your own ability to play the impacted card type, so you'll need to be crafty when deck-building. Despite their trade-offs or tricky casting conditions, lockdowns remain a lethal and competitive lot since they're notoriously difficult to remove. But with dozens of powerful nets available, which lockdowns reign supreme? These are the ten best cards to ensnare your opponent in Yu-Gi-Oh! Here's a good example of a field-wide cage, binding you with the same chains placed on your opponent. 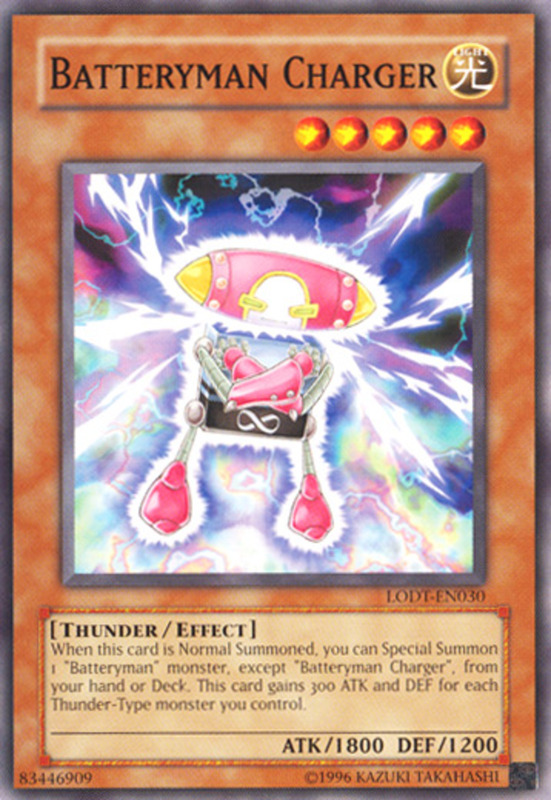 Once activated, this continuous trap makes both players set their spells before using them, only letting them be activated on following turns (similar to traps). 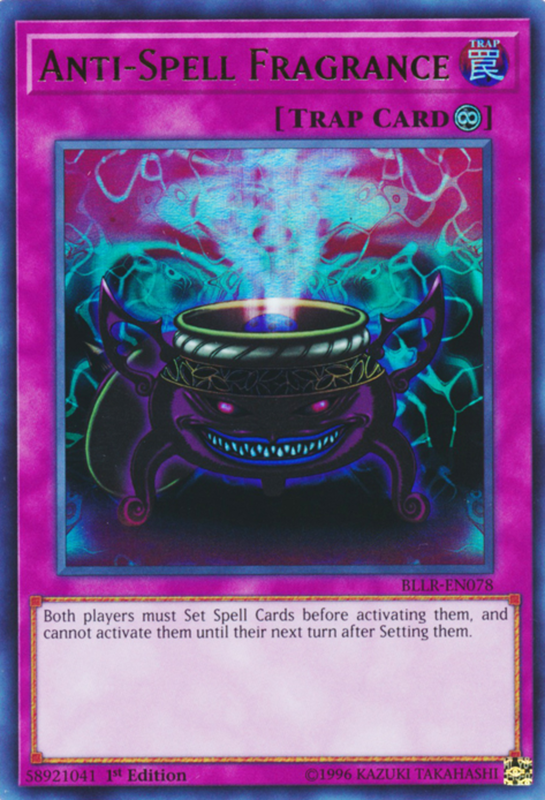 Even quick-play spells (which normally have the instant speed of traps) will have to wait until at their controller's next turn to be played, forcing duelists to wait an entire turn before using their sorceries, greatly slowing their strategy. While this impacts you as well as your opponent, you can simply set (or activate) all you spells before triggering Fragrance to avoid its net. It's also a great turn-one card, letting you activate your field and continuous spells, set anything remaining, then prepare your trap, ensuring a full field for you and a stagnant field for your adversary on their move. Since most spell/trap removals stem from spell cards themselves, your opponent shouldn't have many quick ways to remove Fragrance, and this pesky trap is particularly deadly alongside Dark Simorgh—but more on that later. 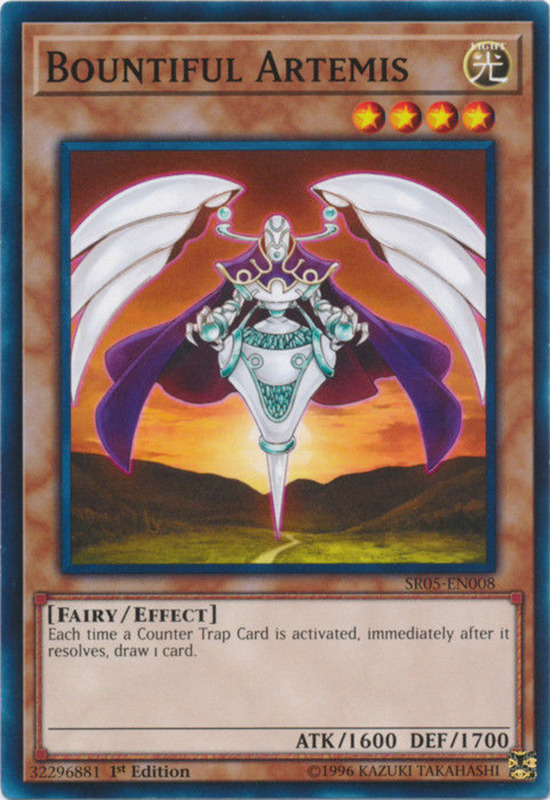 Most effects that skip your opponent's draw phase, like that of Yata-Garasu, have been banned for their daunting powers, but Mystical Knight of Jackal offers a nice substitute since it can waste your opponent's draw, forcing them to reclaim beaten units. Jackal bears a level of seven, so you'll either need two sacrifices to tribute summon him, or you'll need to gimmick him to the field with special summons (pendulum cards work well). 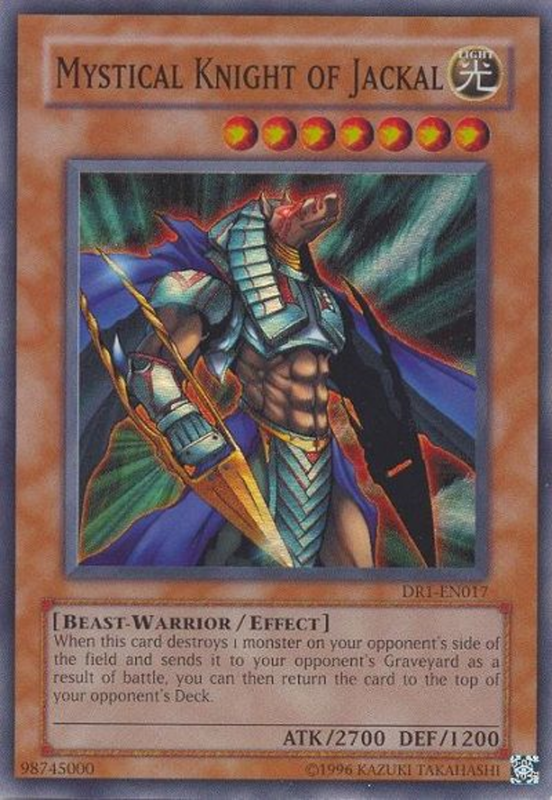 Fortunately, Jackal brandishes an impressive ATK score of 2700, perfect for triggering his effect: when he destroys an opponent's monster in battle and sends it to the graveyard, you can place that monster on top of your opponent's deck. 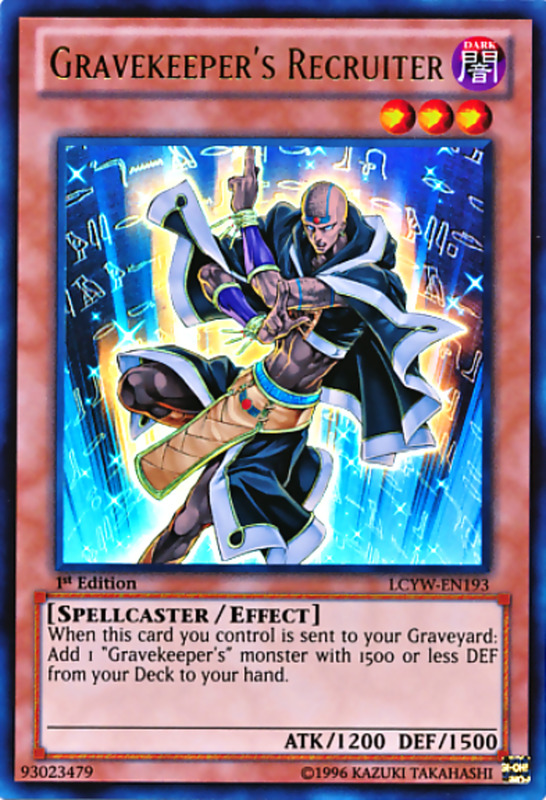 This kills their next draw by spending it on a monster you've already beaten, and it prevents graveyard revivals or abilities. As icing on the cake, you can activate this trait multiple times in a single turn (perhaps if Jackal gains an extra attack), it's optional and can be ignored if desired, and it can even apply on your opponent's turn. 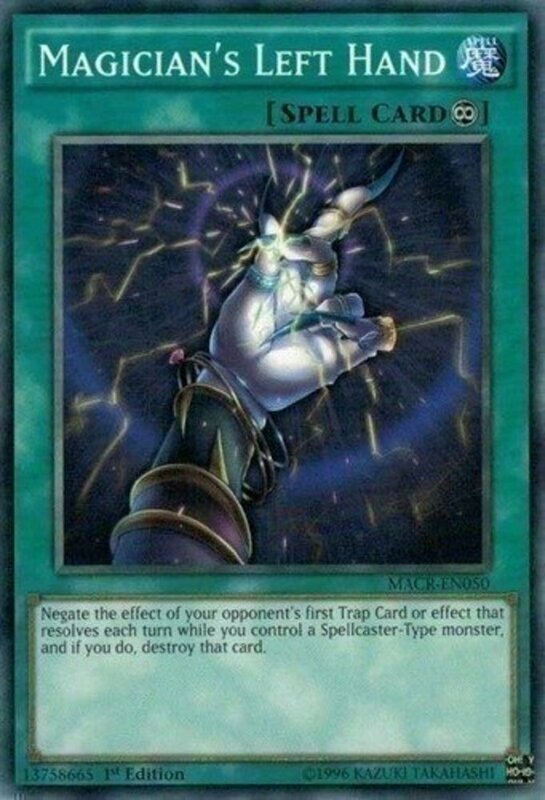 This assists if your opponent attacks Jackal but you either mess with their monster's ATK (using instant cards like Shrink) or increase Jackal's score (using a hand trap like Honest). Many monsters like Dupe Frog or Magician's Valkyria can guard your other monsters against attacks, but few can also defend against effects. Although Watthopper's 0 ATK and DEF make it worthless in battle, it'll shield all face-up Watt monsters from both attacks and being targeted, an awesome barrier that's especially potent when two Watthoppers are simultaneously fielded, shielding each other. Of course, this only works with the Watt archetype, and your opponent can still hit you with non-targeting removals like Raigeki, but it's still a powerful barricade that drastically stalls your foe. Due to their low power, the Watt archetype also fuses well with another famous lockdown, Messenger of Peace, a continuous spell that only lets monsters with less than 1500 ATK declare an attack, further increasing your shutdown tactics. A risky but rewarding card, the twenty-first arcana unit needs two tributes to normal summon, so it's a good candidate for special summons (its fairy type can help with this). When summoned, you toss a coin; heads give you the option of (during your end phase) sending two monsters you control to the graveyard to entirely skip your opponent's next turn, while tails adds the top graveyard of your opponent's deck to their hand during their draw phase. The tails effect not only denies access to your desired heads ability but actively assists your opponent, so it's smart not to take the gamble and use the field spell Light Barrier to guarantee your heads effect. When you have it active, you can forfeit two monsters at the end of your rounds to entirely skip your opponent's turn! That's an absolutely monstrous effect that can let you play indefinitely as long as you have minions to sacrifice, and in the meantime, you'll be decimating your enemy's life points with World's impressive 3100 ATK (stronger than even a Blue-Eyes). 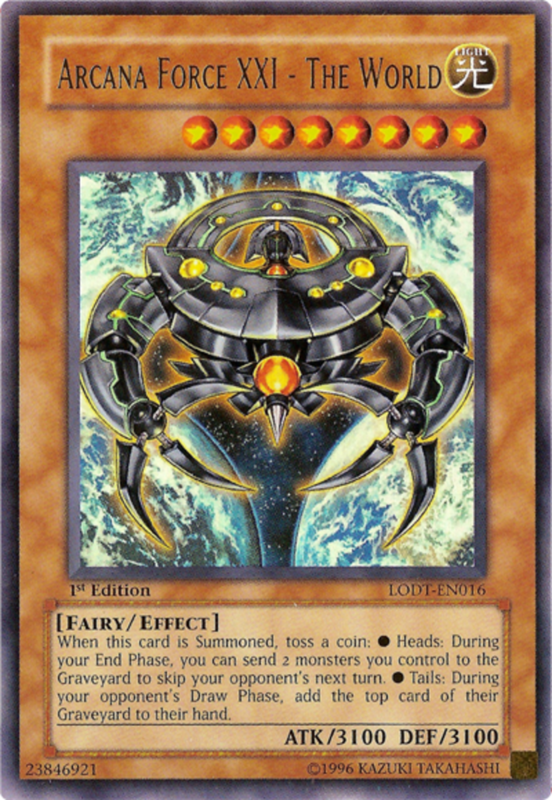 Note that while token monsters can't be used in its ability, The World can use itself for its own trait, giving you a nice last resort to extend your chain by one last turn. Finally, even if you summon The World and accidentally apply its tails ability, you can use it for link material to avoid the drawback. Skill Drain saps two prices for its terrorizing powers. First, you must pay 1000 life points on activation, a fair chunk of your initial 8000 starting life. 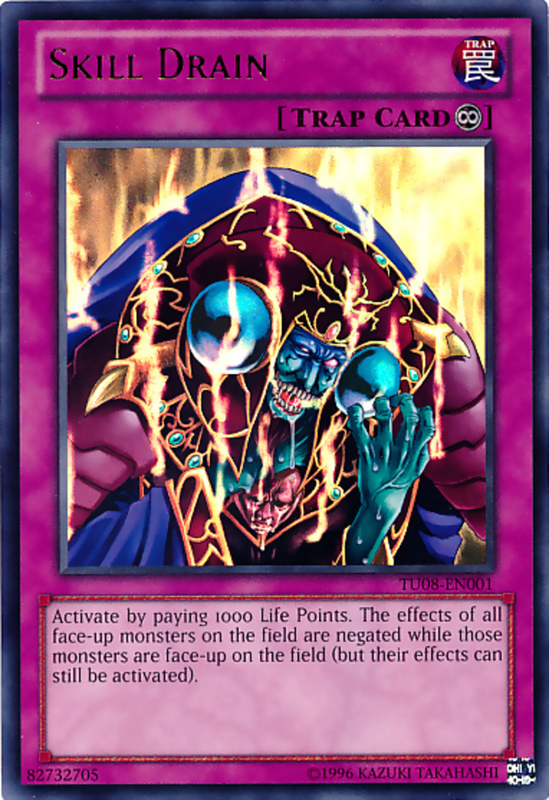 Also, it impacts your field as well as your opponent's, entirely negating the effects of all face-up monsters regardless of their allegiance. This can absolutely ruin your foe's structure, as creatures form the crux of most decks, turning them into mindless normal monsters with no extra effects to assist your foe. To avoid the drawback yourself, Skill Drain works well in builds that either contain few or no monsters, or revolve around the usage of normal monsters (who won't have any skills to drain). 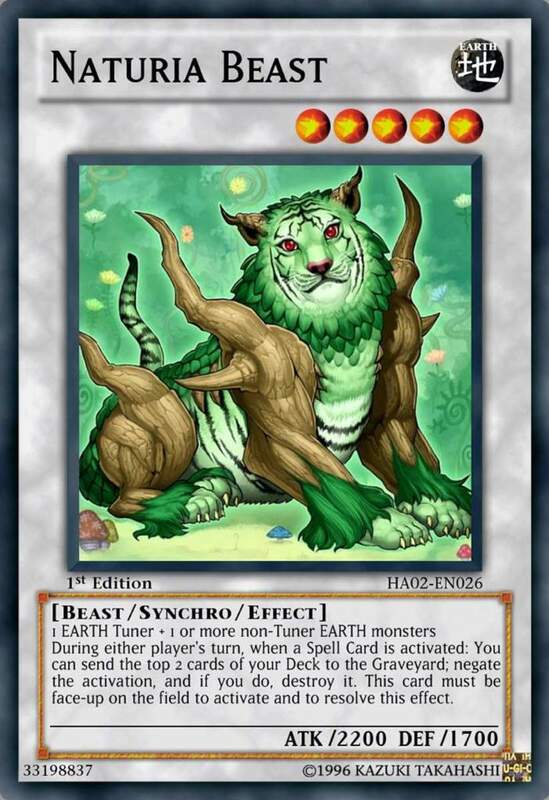 Resting dormant in your extra deck until needed, this beast-type synchro monster hits the arena with a decent 2200 ATK, but we're really interested in its effect. On either player's turn, when any player activates a spell card, you can send two cards from the top of your deck to the graveyard to negate and destroy the activated card. Not only can you use this trait on either turn, since it doesn't bear the pesky "once per turn" errata, you can trigger it multiple times on the same round, completely shutting down your foe's spellcasting as long as your deck has cards to spend. You can even negate your own units in the rare cases where you'd want to. Unless you're facing an uncommon mill deck, you should have plenty of cards in supply to mill, and sending them to the graveyard can actually prove beneficial by preparing recoveries or graveyard traits. Finally, note that while Naturia Beast does mandate its materials (both its tuner and any non-tuners) bear the earth attribute, it doesn't actually require you to use its own Naturia archetype or any specific tuners, blending well into a variety of earth decks. This pair shares a slot since each does the same thing, just with a different type of card. Both are continuous spells that only function while you control at least one spellcaster-type monster; Left Hand negates the first trap your opponent plays each turn while Right Hand negates their first spell. These are both awesome effects that offer a modernized take on the classic "Secret Village of the Spellcasters" without using your single field spell zone or sticking you with a disadvantage while you don't control spellcasters. 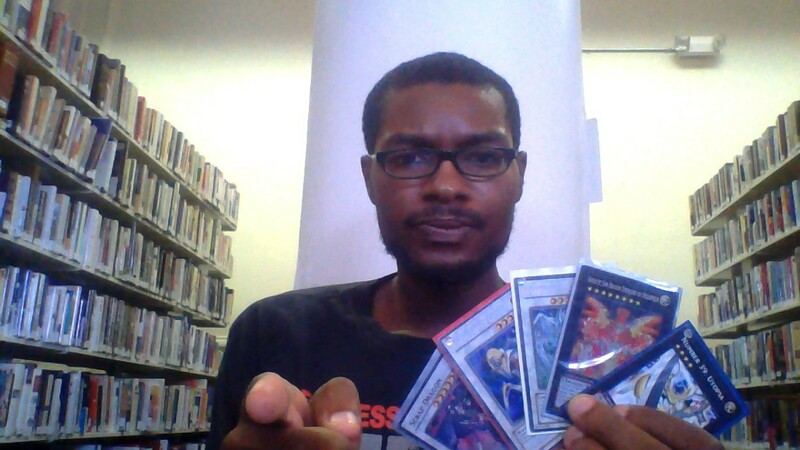 Right Hand usually assists your deck a bit more due to the abundance of spells, but both are worthy fits for any build with a healthy array of sorcerers. 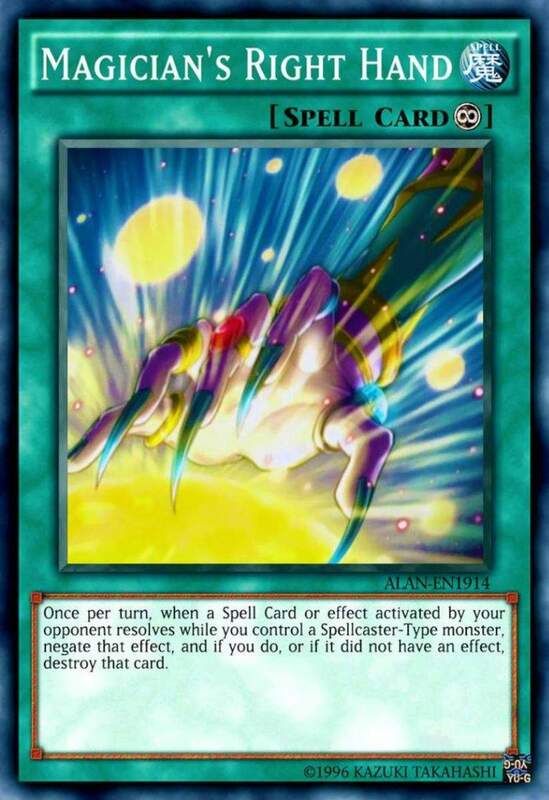 These cards even enjoy their own support units that can search them from your deck or activate them on your opponent's turn, like the spell Magician's Restage and the monster Performapal Sky Magician. Dark Simorgh was infamously powerful when released years ago, and it still maintains a worthy snare. 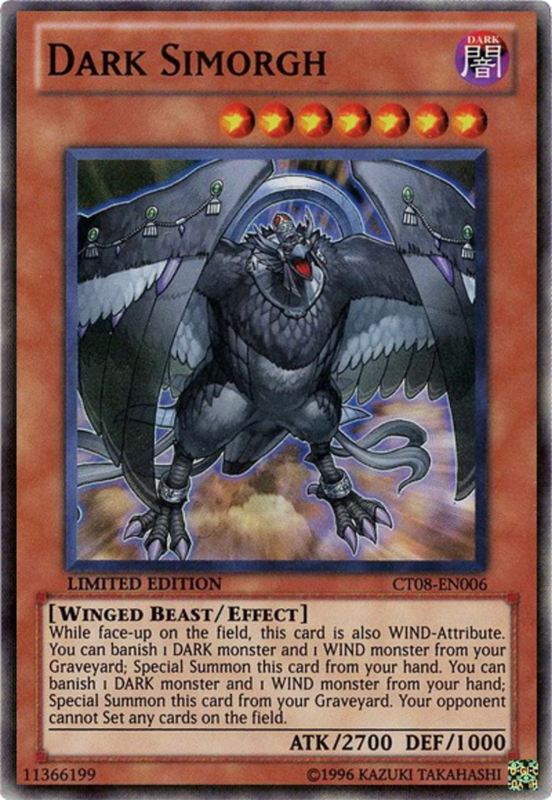 As a level seven winged beast, you'll need two sacrifices to normal summon, but Simorgh can banish a wind and dark attributed monster from your graveyard to special summon itself from your hand, and it can banish a wind and dark monster to special summon itself from your graveyard, offering several ways to harness your raven. Naturia Bamboo Shoot only tangles your opponent when tribute summoned using another Naturia as sacrifice, essentially restricting it to Naturia themes. Additionally, its 2000 ATK veers a bit low for a level five monster. 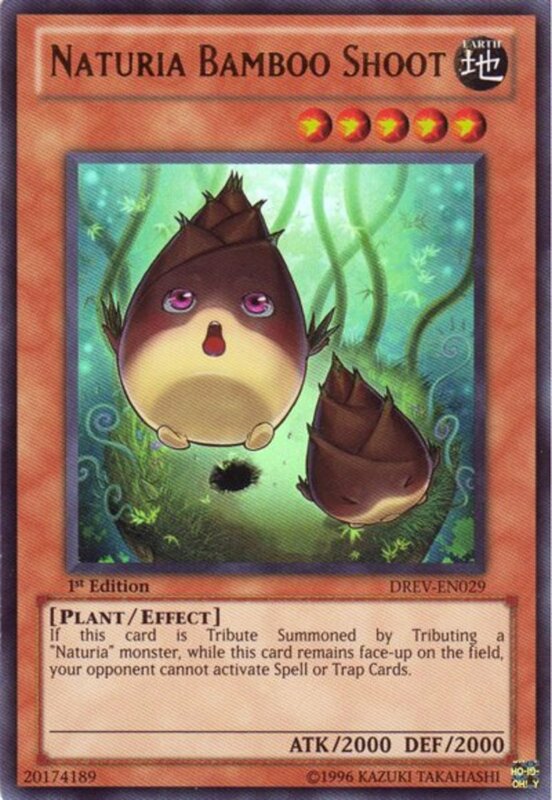 However, Bamboo Shoot also bears 2000 DEF, letting it hold its own from either battle position, and when fielded by tributing a Naturia, it completely prevents your opponent from activating both spell and trap cards! Entirely blocking two types of cards forms a desperate situation few adversaries will ever rebound from, almost promising you the win. To ensure Bamboo Shoot stays alive, use cards like "Burden of the Mighty" to weaken opposing creature or "Solidarity" to increase its own stats. 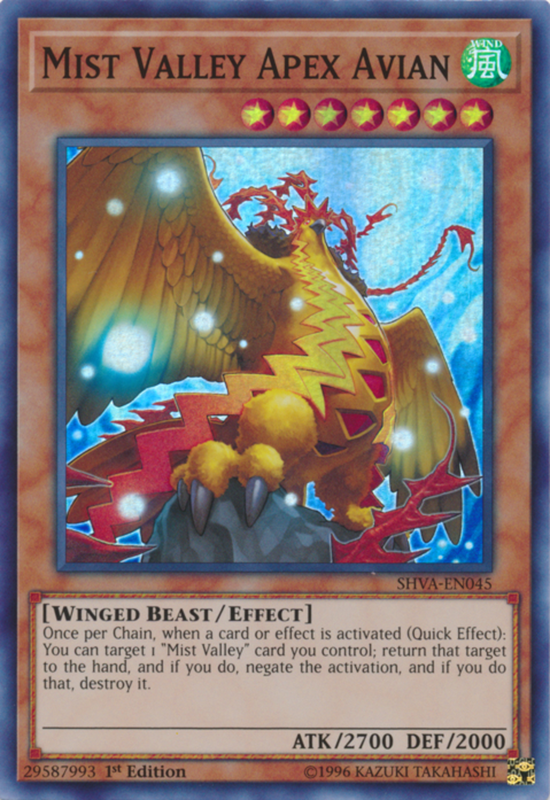 A long-time favorite of mine, Mist Valley Apex Avian functions particularly well in Mist Valley deck structures, but performs superbly even on its own. 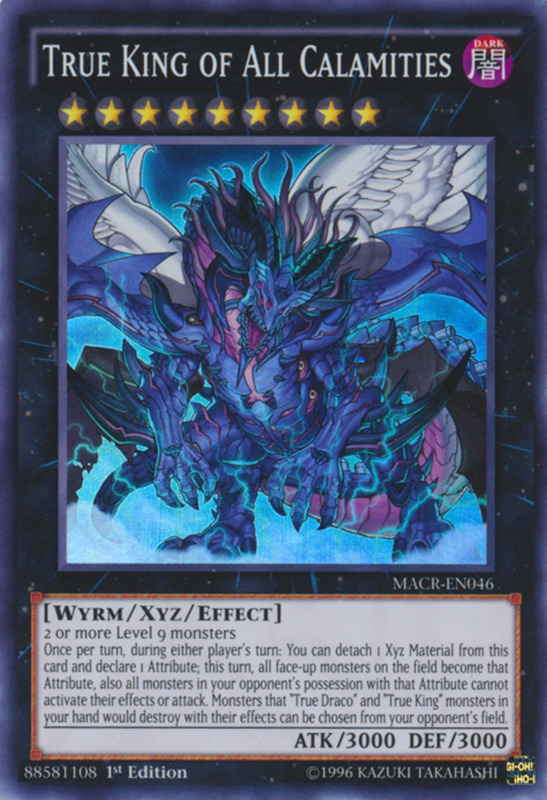 Like Dark Simorgh, it's a level seven winged-beast with 2700 ATK, granting it sturdy battle prowess but requiring two tributes if normal summoned. However, Apex Avian can (on either turn) negate and destroy an opposing effect by returning one Mist Valley card you control to your hand—including itself! Potential negation against anything your foe tries will rapidly detriment their plays, and if you have multiple Apex Avians out, you're welcome to use their abilities (once each) in the same turn. To quickly re-summon your bounced birds, use common pendulum cards with a scale of 8 or higher to special summon them without tributes, once again ready to counter whatever your opponent throws your way. In my eyes, this is one of the best cards ever printed (especially since it's still legal) that fits into both my pendulum and Mist Valley blends, and thankfully, you can often buy it for less than three dollars, a surprisingly low price for such a versatile and competitive warrior. Today we've examined an awesome variety of legal units to capture your adversary in several prisons, but many more remain unexplored. There's also the forbidden lockdowns, like the infamous draw-disabling of Time Seal or the quick-play bouncing of "Majespecter Unicorn - Kirin", although these are reserved for casual play unless they ever happen to escape the ban lists. Luckily, duelists enjoy plenty of unrestricted ways to snag their foes in pitfalls, leaving little hope for escape. 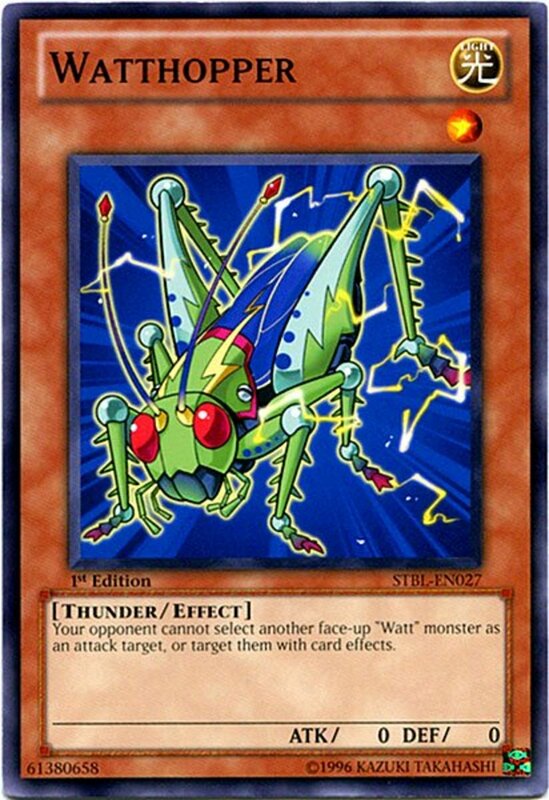 But for now, as we eagerly await Konami's next expansion of lockdown cards, vote for your favorite unit and I'll see you at our next Yu-Gi-Oh countdown!